The left-leaning Beirut daily al-Safir (The Ambassador) discusses the beginning of a new campaign by the US-backed Syrian Democratic Forces (SDF) against Daesh (ISIS, ISIL) in the northern half of al-Raqqa Province. 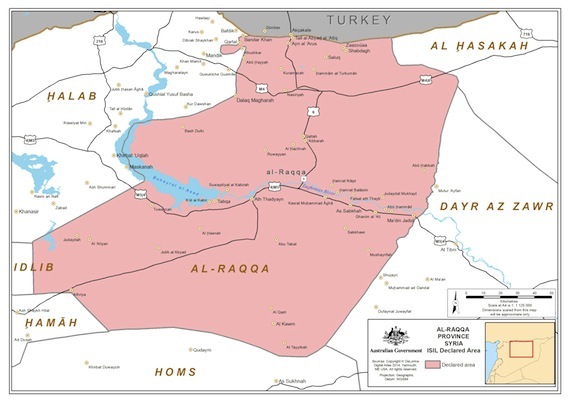 The south of the province and its capital, also named al-Raqqa, are a base for Daesh. It has, however, the ability to strike north into Kurdish territory. The SDF will advance under the cover of American and allied air support. Indeed, Russian Foreign Minister Sergei Lavrov offered Russian help in the campaign. The US Pentagon, however, has in the past declined to have direct coordination with Russia in Syria. Russia said it believes that Daesh would be rolled up in al-Raqqa and Mosul much more quickly if Washington and Moscow cooperate. Rughda Filat of the SDF said on twitter that the goal of this operation is to defeat terrorism in al-Shidadi (south of Hasaka), Tel Abyad (in the far north of al-Raqqa Province) and Kobane. All three are towns where Kurdish YPG fighters successfully defeated and expelled Daesh forces. The campaign began from Tel Abyad and Ain Isa. Another spokesman said that the US-led coalition had launched dozens of air strikes on Daesh positions in the north of al-Raqqa Province and in al-Raqqa city itself to soften it up for the SDF advance. Some 22 Daesh fighters were said to have been killed in the strikes. The largely Kurdish character of the SDF means that it has difficulty attracting the support of the Sunni Arab opposition to the al-Assad regime. Another observer said, all Syrians hate Daesh, but all of them have difficulty rooting against it if the alternative is the SDF or the Shiite militias outside Falluja in Iraq. الأمة كلها تكره داعش و الأمة كلها تدعي سراً لداعش ضد الحشد في الفلوجة و قوات سوريا الديموقراطية في الرقة ! There have also been firefights between the YPG Kurds and the Syrian opposition– on May 23, the Sunni Arab rebels killed 6 YPG militiamen outside Aleppo. And, the YPG is accused of cutting off fuel supplies surreptitiously purchased by the rebels in Idlib Province from Daesh. Arab populations accuse the YPG of engaging in ethnic cleansing in order to establish a Kurdish mini-state, Rojava, and so are suspicious of its advance further into Sunni Arab territory such as southern al-Raqqa Province.